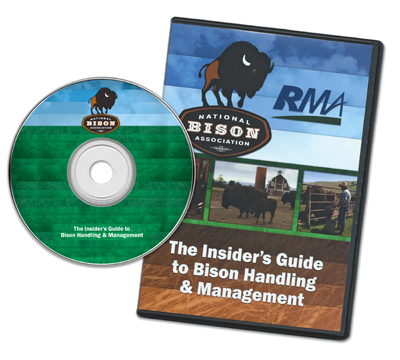 The Insider’s Guide to Bison Handling & Management DVD has over 40 minutes of information ranging from animal management to meat marketing including animal selection, breeding, handling health and nutrition business planning and more. Designed to introduce new and prospective producers to bu alo ranching and marketing but depth of content has much to o er the experienced producers as well. Purchase of a National Bison Association Active or Life membership includes: The Insider’s Guide to Bison Handling & Manage- ment DVD, Bison Producer’s Handbook, Bison 101 & 201 online training, members’ resource area of the website, referrals to local bu alo farmers and ranchers, personal consulting from NBA sta . An Active membership is the most economical way to learn about the bison industry. Join the NBA, or give us a call at (303) 292- 2833.